INDIANAPOLIS, Indiana, December 23, 2009 (ENS) – A $93 million court settlement requiring Duke Energy, one of the America’s largest electric power companies, to eliminate sulfur dioxide emissions from a coal-fired plant in Indiana, was reached Tuesday, state and federal officials said. 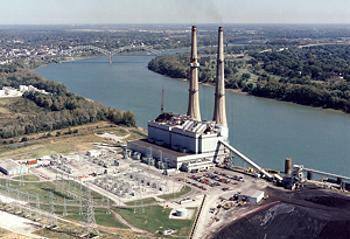 The states of New York, New Jersey and Connecticut joined the federal government and two environmental groups in a 1999 lawsuit over pollution from the 560-megawatt Gallagher Station in Floyd County, located across the Ohio River from Louisville, Kentucky. Prevailing winds carry the plant’s emissions eastward. Under the terms of the settlement, filed in U.S. District Court for the Southern District of Indiana, Duke Energy will spend $85 million to reduce air pollution at the Gallagher power plant, pay a $1.75 million civil penalty, and spend $6.25 million on environmental mitigation projects. The company has the option to either convert two of the units from coal to natural gas or retire the units. Duke said it currently expects that it will convert the units to gas, but no final decision is required until Jan. 1, 2012. The company will install additional pollution controls on the station’s other two units and switch to using lower sulfur fuel at the plant. “This important settlement resolves lengthy litigation on very favorable terms,” said Ignacia Moreno, assistant attorney general for the Justice Department’s Environment and Natural Resources Division. The settlement resolves violations of the Clean Air Act’s new source review requirements found at the Gallagher generating station. The case began in 1999 when the EPA alleged that Cinergy, which merged with Duke Energy in 2006, undertook six power plant upgrades in Indiana and Ohio without obtaining new permits. The EPA alleged that the company’s work to increase power output did not qualify as routine maintenance and that Cinergy should have predicted the projects would increase emissions at the plants. The Duke case went to trial in May 2009, when an Indianapolis jury found that Duke violated the Clean Air Act by failing to obtain required permits and pollution controls before making modifications to Gallagher Units 1 and 3 that caused significant increases in sulfur dioxide. The hearing to determine the remedy for the violations was set to begin on January 25, 2010 but the remedy has now been resolved by the settlement. “The settlement will achieve substantial emission reductions through the use of natural gas and other control measures, and it includes important steps to mitigate the negative impact from past illegal emissions as well as a significant civil penalty,” Moreno said. When released into the air, sulfur dioxide is converted to sulfuric acid and falls as acid rain. The settlement is anticipated to reduce sulfur dioxide emissions at the Gallagher Plant by almost 35,000 tons per year, an 86 percent reduction when compared to 2008 emissions. The EPA says this reduction is equivalent to the emissions from 500,000 heavy duty semi-trucks, more than all of the trucks registered in Indiana, Illinois, Kentucky, and Ohio combined. Repowering the Gallagher generating units with natural gas also will reduce emissions of nitrogen oxides, particulate matter, mercury, and carbon dioxide. The combined nitrogen oxide emissions from Units 1 and 3 are expected to decrease by about 2,198 tons per year as compared to 2008 emissions. The switch from coal to natural gas will decrease these units’ emissions of the greenhouse gas carbon dioxide by roughly half per unit of electricity. Duke is required to spend $6.25 million on environmental mitigation projects, including $250,000 for the U.S. Forest Service to address acid rain in downwind national forests. Duke Energy will invest $5 million of those funds in an upgrade to expand the power output of the company’s 81-megawatt Markland Dam hydroelectric power plant near Vevay, Indiana. The company had been exploring a 20 percent expansion of the Markland facility, and this settlement facilitates that effort. The expansion will need Indiana Utility Regulatory Commission approval. The states of New York, New Jersey and Connecticut, as well as the Hoosier Environmental Council and the Ohio Environmental Council joined the federal government in the settlement, which includes $1 million for environmental mitigation projects to be allocated among these states. “This is a reasonable settlement that resolves some long-standing issues, advances our two decades long effort to improve air quality in the region, and positions us to comply with increasingly stringent environmental regulations,” said Jim Turner, president and chief operating officer of Duke Energy’s Franchised Electric and Gas business. “The net result of these investments will be a reduction of sulfur dioxide and nitrogen oxide emissions by approximately 70 percent across Duke Energy’s five-state service area by 2010,” Manly said. Headquartered in Charlotte, North Carolina, Duke serve four million customers in North Carolina, South Carolina, Indiana, Ohio and Kentucky. Sulfur dioxide and nitrogen oxides can cause severe harm to human health and the environment. After being emitted from power plants, these pollutants are converted to fine particles of particulate matter that can lodge deep in the lungs, causing a variety of health impacts including premature death. Sulfur dioxide and nitrogen oxides are also significant contributors to acid rain, smog, and haze, which impair visibility in national parks. Air pollution from power plants can travel significant distances downwind, crossing state lines and creating region-wide health problems.